When I first saw Hamza it was mid-December and he hadn’t been eating for two days. His face was pale and the eyes half-opened, almost as if he could have fallen asleep any moment. That morning we met in a hostel near Omonia Square, in downtown Athens, where a Spanish friend had befriended him few days before. At that time, an English volunteer was paying 9 euros per night for his room. Hamza is Pakistani and originally from Gujranwala, a town of more than a million inhabitants, north of Lahore. Around a year ago he arrived in Greece, hoping to build a better life after working for four years in Oman. He is a timid and educated 30-year old man, the only one to have studied of all his family. In addition to Urdu, his mother tongue, he speaks a fragmented English and a few words of Arabic. That day, he arrived with his backpack, a long beard, all his documents in order, but above all, the hope that we would have helped him finding a new home. Within three days, the money covering his stay at the hostel would have been over, he said, and if he did not find an alternative he would end up once again sleeping in the street. In Athens, as in many European cities, becoming invisible is easy, especially if you do not have friends or a family nearby to rely on. You end up living in the street and once there you are just anonymous presence, soon to become gray like the city concrete or the sky during winter time. That morning, the first thing we did was to bring Hamza to talk to Metadrasi staff, a Greek NGO providing interpreting services. There, thanks to the help of one of the translators, we understood the first important things about his story. Hamza had all the necessary documents, the social worker assured us after having interviewed him in Urdu. According to his account, he would have attended a first interview for the asylum procedure, but he would have missed a second one, scheduled in early December. Another staff member then pointed to a name on an excel sheet: Greek Council for Refugees (GCR). “This is where you have to go”, he said, “to arrange an appointment with lawyers who will then ask for one of our translators”. Founded in 1989, the Greek Refugee Council has, as mission, the protection of asylum seekers’ rights through the provision of different services, including a legal aid unit. That day, when we arrived in front of their office door, an employee told us to come back the morning after at eight o’clock. Greek bureaucracy, like that of every country, acts at its own pace, and often the rigidity of the procedures clashes with the daily needs of people on the move. This gap creates a fracture between the rights as established by laws and the ones which can be accessed, and people, waiting for an appointment, end up living on the street or with no food for two days in a row. That afternoon, being unable to do anything, we decided to ask a little bit around, trying see if one of Exarchia’s squats (the ‘anarchist’ district of Athens) could help us find an accommodation for Hamza. Then, both friends and locals suggested us to try visiting a squat named ‘5th School’. The state’s inability to efficiently cope with the refugee crisis has opened up an area of action in which the role of squats has become important in providing essential services to a large number of people. Athenian squats are managed according to self- organization principles, do not accept funding from either the state or non- governmental organizations, and their so-called ‘residents’ enjoy considerable autonomy, in stark contrast with what happens in the official camps. At the moment, the heart of Athens is filled with these informal shelters: in most cases they came to be in very large public buildings such as former hotels or schools, where people live or carry out a number of support activities (such as preparing meals or distributing clothes). Within these informal facilities, the number of European volunteers vary and some of them are mainly managed by refugees. That afternoon, following the directions we were given, we went up to the top of Exarchia and at one point, the presence of the 5th School was announced by the notes of a Fairouz song, a famous Lebanese singer. From one of the windows in the building, the music played loudly and finding the entrance of the building was as quick as going around the corner. This squat, located in what once was a school, has its walls covered with graffiti and cracks and overall the building looks both majestic and decadent. At the entrance, we asked for help in Arabic to a man sitting on a wooden chair who soon called one of the few Urdu-speaking residents. When the man arrived, Hamza began to tell his story as the improvised interpreter nodded and a crowd of people gathered around them. However, since the beginning, it was clear that the person we needed to convince was only one: a very special Syrian, whom we had already heard of in the previous days, and from now on we will refer to him with his initial, C.
This activist, famous within the Syrian community and among the Athens-based international volunteers, according to the international media has been living in Greece since the late eighties. On the day we met, he was wearing worn-out jeans, a pair of hiking boots, and kufiyah around his neck. While Hamza was explaining his story, some residents of the squat went to call him so that he could decide what to do. When he arrived, after a short presentation, we told him in English that our friend would have ended up sleeping in the street in two days and we wanted to find him a place. He listened carefully and after we had finished explaining, he advised us to visit another squat, established just few days earlier, and aimed at hosting only men above eighteen years old. With the help of the navigator and following Hamza, we found the second squat without much difficulty: in front of that place, my Spanish friend and I had already passed by the previous day but from the outside it looked just like another abandoned building. Once there, some men who were in the building’s yard approached us, asking about the reason of our visit. After we had briefly explained our story, we were told that perhaps something could be done but that for our friend to sleep there, we needed an authorization signed by C.
Therefore, we decided to go back to the 5th School but this time, C. immediately made it clear that he did not have time for us and would not sign any paper. “Go back to the squat, ask about Abu Mahmoud Mousa and tell him to call me”, he said. Then, somehow confused, we reached the second squat again. Some of the residents we spoke with before were still outside and when we asked about Abu Mahmud Mousa they told us he had left few days before. The third time we went up to the 5th School, C. was not there anymore. We were welcomed by some of his ‘deputies’ who finally wrote a sort of authorization for us with the full name of our friend and making an unreadable signature. With little hope left, we went down to the second squat again but this time the two guys at the door looked at the paper shaking their heads and said: “Ma fish MaHal” in Arabic, “there is no place”. At that point, we left for good. As we walked down the narrow street, Hamza, with lowered eyes, ripped off the piece of paper. He said goodbye and went back to the hostel. Until today, it is still not clear to me why they did not accept him. He is convinced that it has to do with the fact of him being Pakistani. If you are Syrian, he said, at this moment you are given the priority everywhere, both in institutional and informal shelters. Additionally, the fact of being a single man and above 18 years old does not help, because generally the priority is given to unaccompanied minors, women or people traveling with a family. paper with a date: 20th December, 9 o’clock, which was a new appointment for Hamza to go and talk about his legal situation, trying to reschedule the interview he had missed. “This guy needs a home, an apartment, a place to stay”, we told the social worker. “In order to ask for house-related information, come on Wednesday December 21st, at 8 o’clock”, he replied, handing us a second piece of paper. While this information was communicated, no Urdu translation was provided. After dealing with these bureaucratic procedures, we headed toward Khora, a co- operative in Exarchia located in a rented building and providing numerous services such as: a canteen with free food, a barber, children’s games and language classes. Everything is free and open not only to refugees but also to Greek people. Khora was founded by a group of international professionals who met each other on the island of Lesbos and decided to join forces and create an alternative reception model. There, Hamza can eat twice for free, learn Greek or English, volunteer and make friends. Since my return from Greece, more than a month passed and I have been often speaking with Hamza on WhatsApp. Since around three weeks, he ended up sleeping in the street again near Omonia Square, and he keeps going to Khora every day to eat. As he plans his future in Europe, he tries to save money by doing some occasional jobs. But saving up is not easy and after trying in vain to work as a mechanic, he decided to start selling t-shirts and socks on the street with some friends. For him to be able to continue his journey to Europe, he would need a sum of money he does not currently have and at least for the moment he is forced to remain in Greece. Nowadays, Athens is a laboratory and at the same time a city immersed in a network of polarizing contradictions. On the one hand, there are poverty, emergency, desperation. On the other hand, solidarity, self-organization, goodwill and ability to resist. In the mid of this interwoven web of practices and values, a multitude of individual lives stand; local people and foreigners, refugees and international volunteers. In this humanitarian crisis exploded within an economic and social crisis, the original significance of the relationships between human beings is rediscovered. And empathy, the ability to feel what the other is going through recognizing his right to a dignified and safe life, seems to be the last stronghold left. A stronghold in defense of a frightened humanity, whose life has apparently lost its value. 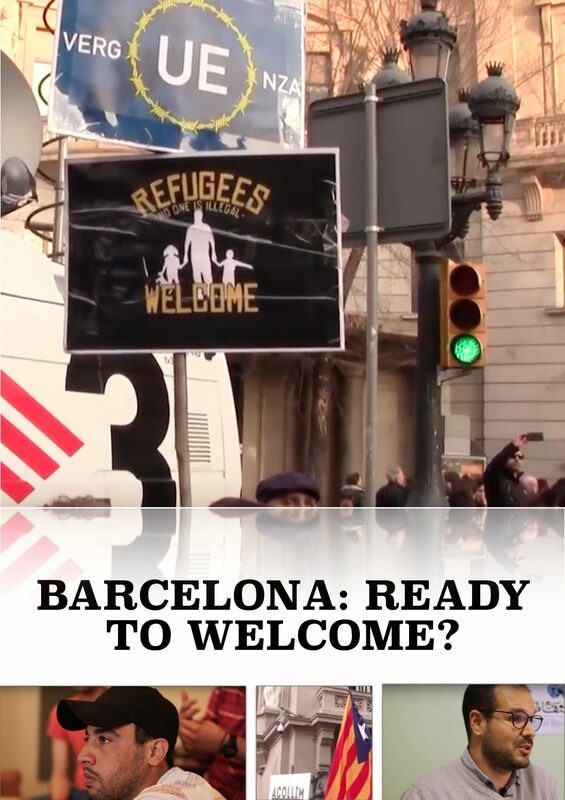 Barcelona: Ready to Welcome is a documentary I co-authored together with Ivana Ujčić, a Croatian journalist with extensive experience in TV and radio journalism, and Johannes Vanneste, an Arabic philologist and anthropologist who, in his spare time, loves to make videos. The documentary was produced between April and August 2017, when the three of us were all living in Barcelona. 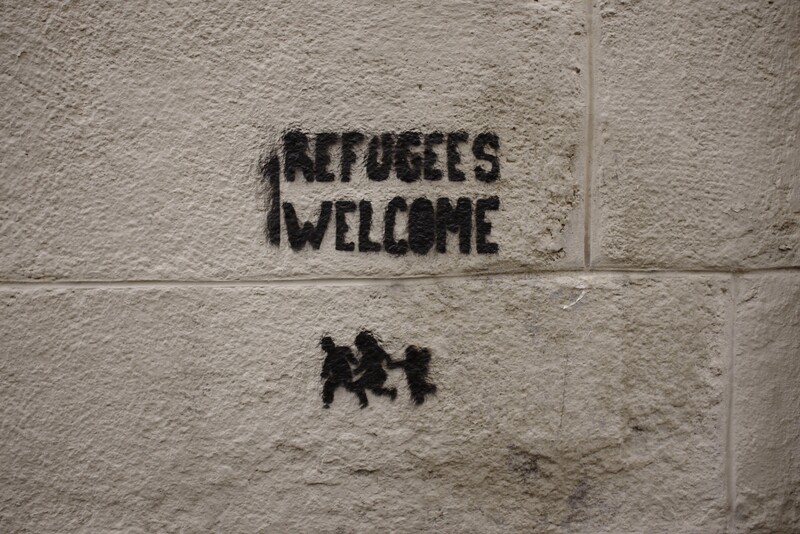 In order to explore to what extent refugees felt welcomed in the Catalan capital, we talked to some grassroots organisations who were involved in campaigning for refugees’ rights and hosting asylum seekers. Furthermore, to provide the viewers with a more accurate and complete picture of the situation we included interviews with the representatives of the Catalan and Spanish political institutions. In the light of the most recent events, as authors of this work, we felt the need to clarify our position, in order to minimize the possibility that the content will be manipulated, given the tense political climate. The initial idea behind this documentary was the “Volem acollir” (We Want to Welcome) protest that took place in February in Barcelona when a young organization “Casa Nostra Casa Vostra” created a powerful campaign that resulted in a mass protest with over 160 000 people out on the streets demanding that their government open the borders and to accept more refugees. This event made headlines in the media all over Europe depicting Barcelona as a city whose arms were wide open for people coming to Europe in need of refuge. The February protest was largely supported by the local politicians and the presence of “Esteladas”, Catalan separatist flags, was massive. As journalists, reading news outside Catalonia, we felt that the specific political context that is present in Catalonia today was not clear enough and that there were a few questions that needed to be answered. Why was a rally calling for the ‘opening of the borders’, at the same time, asking for the establishment of new borders? Why was there a need to associate the issue of refuge with the local political tensions with Madrid? And finally, were independentists trying to instrumentally exploit the welcoming image of Barcelona for their political purposes? Those questions were our starting point. They are provocative, abstract and, to a certain extent, theoretical. However, we think they should still be considered legitimate, also in the current heavy political climate. At the end of this 5-month journey, we do not believe that this documentary will fully provide you with the answers to these questions. This is because reconciling their terms is not easy and behind them lie an almost unspoken truth of our times: refugees, not as individuals but as a multitude, are, for many governments, a troubling figure, calling into question the very fundamentals of an entity, the nation-state, that in many political discourses is taken for granted without ever been fully questioned. This documentary was originally published by: MeltingPot Europa. Moreover, the documentary has been also published by the Croatian media outlet Lupiga.